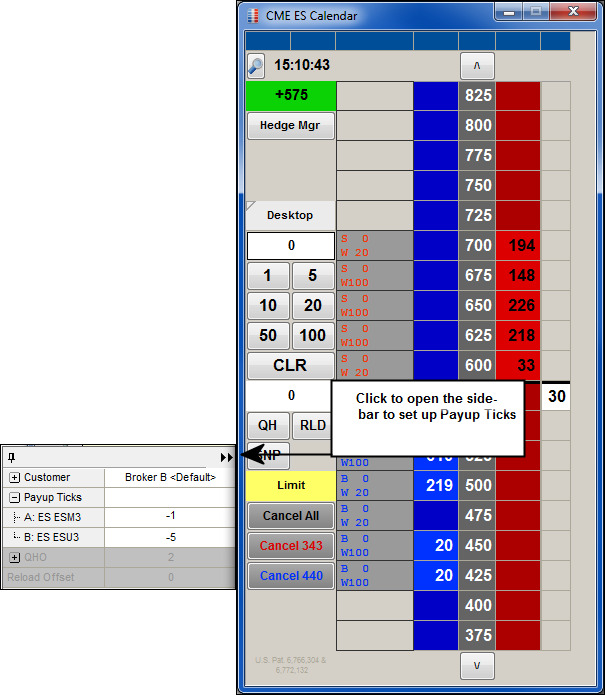 The Payup Ticks settings in the MD Trader Spread Pane side-bar let you enter and apply Payup Ticks to a working Autospreader order. Payup Tick values can be between -9999 and 9999. Generally, a positive value is more aggressive and may prevent you from getting legged; whereas a negative value moves away from the market and submits a hedge order that may not get filled, but may result in a better spread price. When in use, the Payup Ticks in the side-bar override the Payup Ticks setting on the Autospreader Configuration window. Payup Ticks are applied to all legs of the spread using the Autospreader MD Trader side-bar while the spread is working. 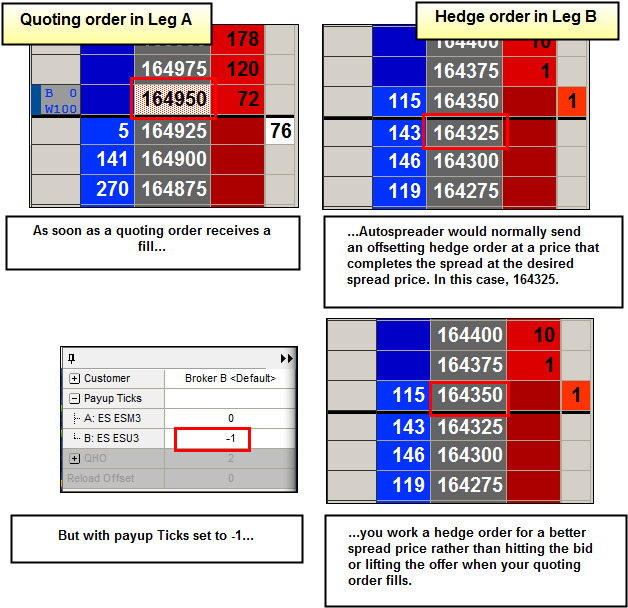 A single Payup Tick value can be applied to the individual legs of the spread using the Autospreader MD Trader side-bar while the spread is working. Launch an existing spread or click New to create a new one. The Autospreader Configuration dialog box appears. Click the side-bar tab on the Spread Pane. The Autospreader side-bar window appears. Select a contract to configure Payup Ticks. The value of your Payup Tick for the function key and corresponding leg is set but can be altered as you view the market in Autospreader. Click the double-arrows to close the side-bar window. Set the number of Payup Ticks you want to use with each function key. Choose the leg pane that will use the Payup Ticks. The Autospreader side-bar lets you enter and apply Payup Ticks to a working Autospreader order.